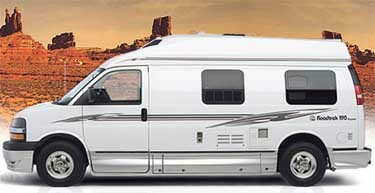 Roadtrek Motorhomes are the best selling Class B motorhomes in North America, and have been since 1990. Roadtrek Class B Motorhomes are packed with features and built with quality...just ask someone who owns one. 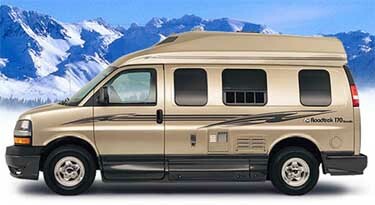 Roadtrek owner's are more likely to purchase another Roadtrek over other makes and models. Their high customer loyalty has been built over the years by providing a well engineered motorhome then is as convenient as it is useful. Whether you are taking a day trip to the beach, going to a sporting event, or going out to dinner with some friends, the Roadtrek Motorhome can do it all. For not much more than a conversion van, you can own a full-blown motorhome equipped with a generator, toilet, shower, refrigerator, hot-water heater, microwave, TV, and DVD player just to name a few. Roadtrek's small size makes it easy to drive, park, and store. With granite style counter-tops, optional leather seating, soft-touch vinyl ceiling, and residential grade cabinetry give the Roadtrek a plush, high-end look. 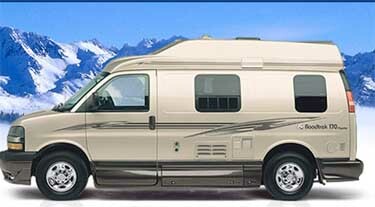 But Roadtrek Motorhomes aren't just another "pretty face". Roadtrek talks the talk and walks the walk by backing their product with a 4 year warranty, four times longer than most manufacturers. 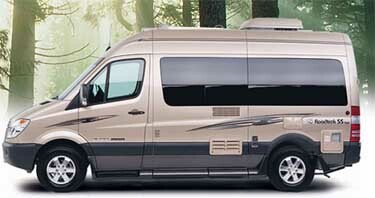 Many Roadtrek owner's are downsizing from a much larger Class A motorhome. They want something that possesses all the amenities found in the Class A, but in a small, nimble, easy to drive package. Try parallel parking a 40' Class A in any major city! Roadtrek's small size yields another major advantage: fuel economy. Some Roadtrek models get over 20 MGP like the new Roadtrek SS Ideal ! With that kind of fuel economy, this is a motorhome that could even double as a second vehicle. Take it the mall, the grocery store, and out to dinner. There are so many reason owning a Roadtrek makes sense. Please contact the RV consulting team at Fretz RV to discuss which Roadtrek model is right for you. Owning an RV can be one of the most enjoyable investments you can make. There are several other reasons RVing may make sense for you, and there are some RV buying tips you should consider. Fretz RV has been a Roadtrek Motorhome dealer since 1988. We have the knowledge and expertise to make your Roadtrek shopping experience a pleasant one. Stop in at Fretz RV and see for yourself why Roadtrek is the #ONE selling Class B motorhome. Let Fretz RV help you find your dream RV! Fretz RV, Your Roadtrek Dealer for Class B Motorhomes and Van Campers !